Power Manager 4.1.2 and Power Manager Professional 4.1.2 are now available. Power Manager is an energy saving solution for Mac OS X. Use Power Manager to reduce the running costs of your Macs, to save time, and to save energy. This update fixes bugs discovered on the new Mac OS X 10.7. We recommend all our customers upgrade to this version, including those not running Mac OS X 10.7. Bug: Fixed timer drift after sleep (Mac OS X 10.7; rdar://9855350). Bug: Fixed incorrectly configured local socket warning (Mac OS X 10.7). Bug: Fixed minor memory leak in new editor. If you encounter problems updating, please download and manually install Power Manager. 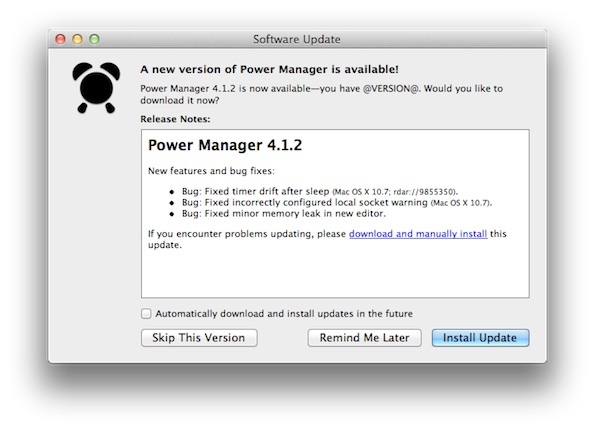 This article was posted in PM4, PMPRO4, and Power Manager and tagged Lion, Mac OS X 10.7, Power Manager, Power Manager Professional, and software update.